Harvard's Gothic Revival Gore Hall is a stand-out among 19th century college buildings. Built in 1838 by architect Richard Bond, this was the first building at Harvard specifically meant for a library. 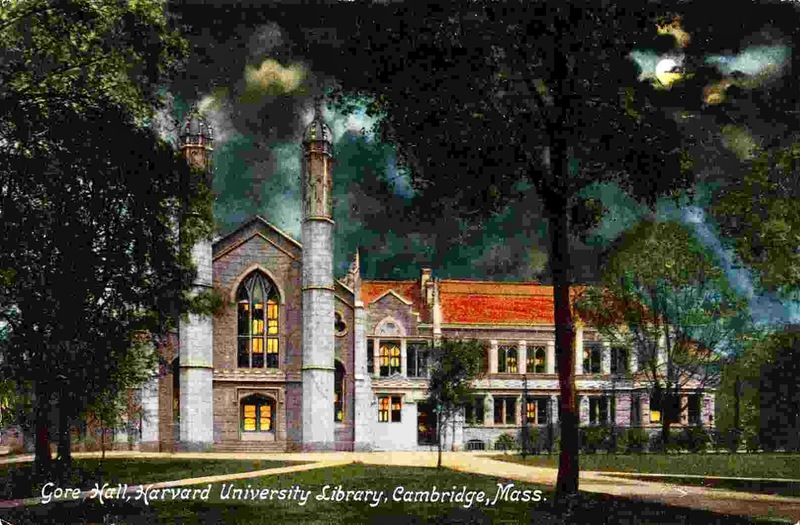 While Harvard possesses many fine buildings, many tend to the heavy and rectilinear, so it was a shame that the lively Gore Hall was torn down in 1913, on its seventy-fifth anniversary. 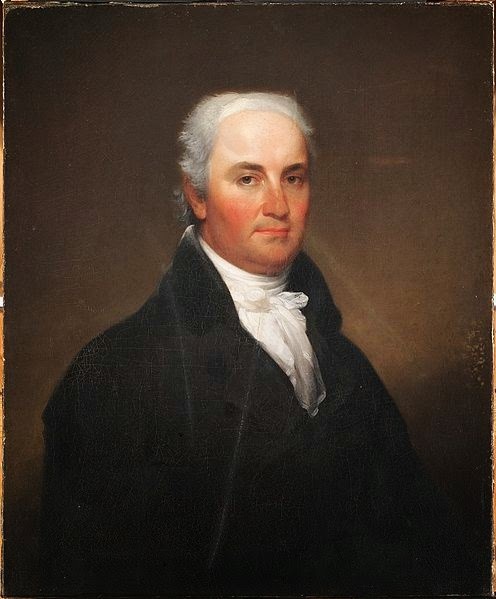 Gore Hall was named for famed Harvard alumnus Christopher Gore, 1758-1827, patriot and politician, who in his will left Harvard an exceptionally generous $100,000 (one third of the eventual cost of the library). Gore is known to many because of his exceptionally fine Federal house in Waltham, Massachusetts called Gore Place, built in 1806. I don’t know whether Gore meant specifically to build a library for Harvard, but the honor was appropriate, as Gore was interested in student welfare, was known to be scholarly, and had assembled an extremely fine personal library at Gore Place. While I have collected many photographs of Gore Hall, my favorite is the one below by famed Boston photographer George Kendall Warren, 1824-1884. In this very fine c.1860 architectural portrait, the details are crisp and the contrast is dramatic, with the silhouetted elm branches echoing the Gothic curves of the building. The architectural inspiration for Gore Hall was the 15th Century King's College Chapel at Cambridge University in England. The Chapel is a much grander building, while Gore Hall is more friendly and intimate, and in my opinion some of its proportions are perhaps more pleasing. Incidentally, this was not the first or last time the American architects would look to the King's College Chapel. 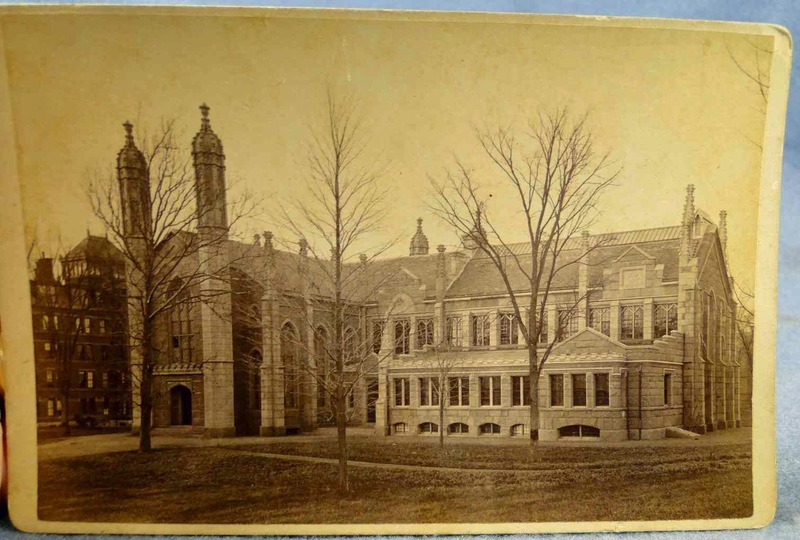 While all three buildings created much different effects, the original building of New York University (built 1833, demolished 1894) and the Old Library at Yale (built 1842, still standing) do share a noticeable family resemblance to Gore Hall. 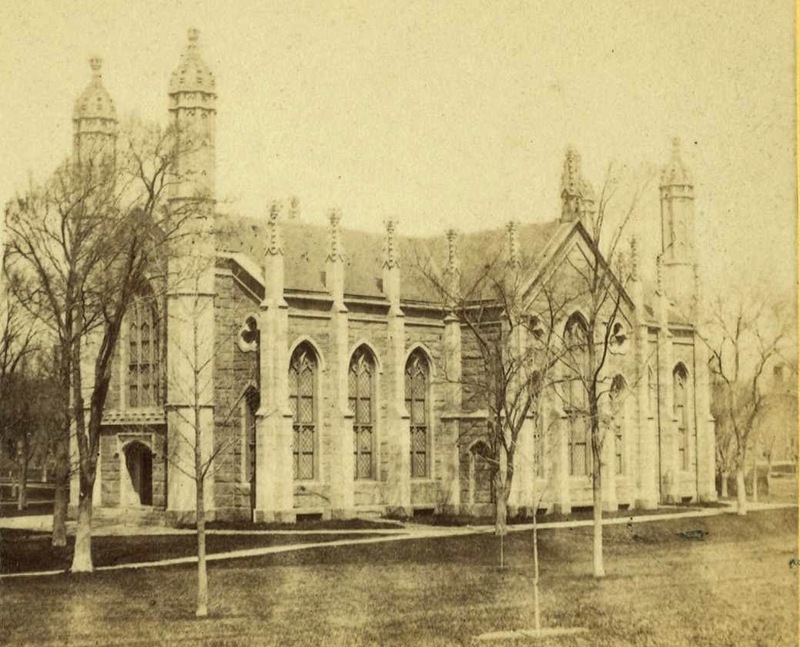 In 1877, Gore Hall had outgrown its storage space, and a large addition was built. While not quite as handsome as the original building, the new wing was important because it was the first library in which the metal book stacks formed the architectural structure of the building, actually supporting the floors and roof as well as the weight of the books. c.1900 colored postcard showing addition. 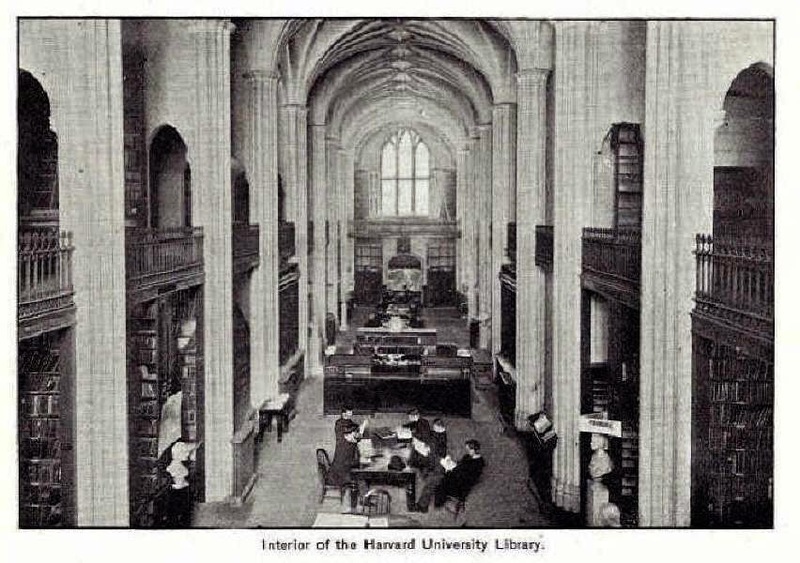 Interior of Gore Hall, from a Harvard View Book, exactly matches James' description. Gore Hall itself has been gone for more than 100 years, but its image still adorns the seal of the City of Cambridge, designed in 1846 by then Harvard president Edward Everett. The other image on the seal, the Washington Elm, only survived a few years longer, until 1923, so Cambridge is ironically symbolized by things that are no longer there—this presumably comes under the rubric of Progress. 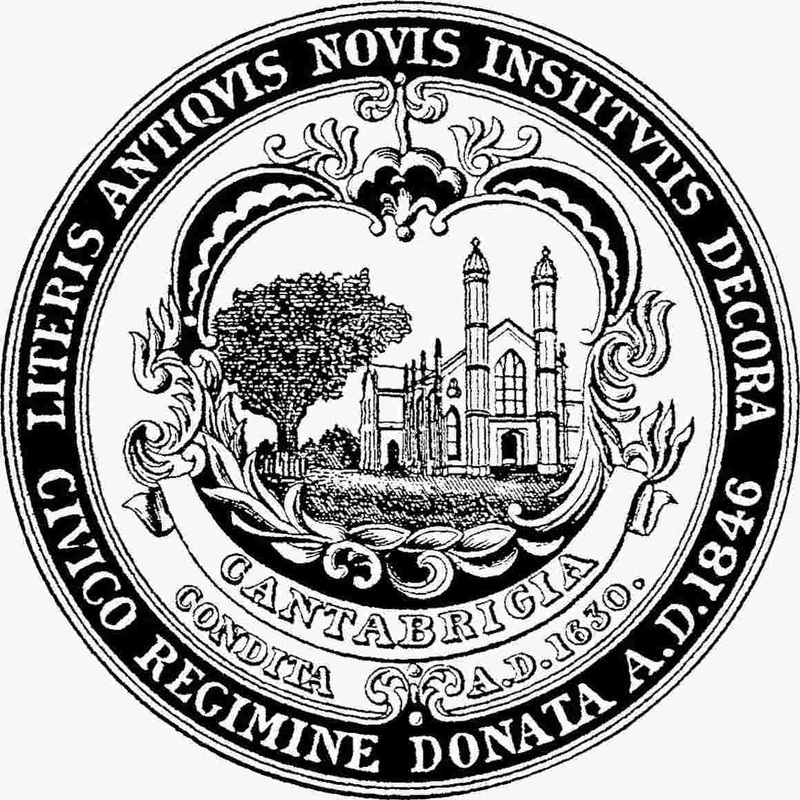 Seal of the City of Cambridge, Massachusetts. The Washington Elm was not actually adjacent to Gore Hall. 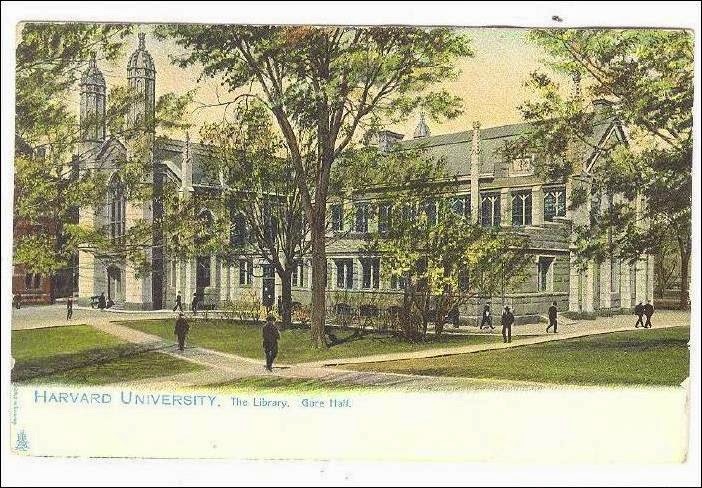 In 1913 Gore Hall, having once again outgrown its capacity, was razed to make way for the current Widener Memorial Library, built to honor Harry Elkins Widener, who went down on the Titanic. Although the Widener is one of Harvard’s most important buildings, it seems a shame that they could not have found another site for it, and that no greater effort was made to save sprightly Gore Hall, by then steeped in University tradition. Gore Hall under demolition. Structural stacks in addition may be clearly seen. When tearing down this building, several of the spires were saved and installed at Appleton Farms, now a public park in Ipswich, Massachusetts. 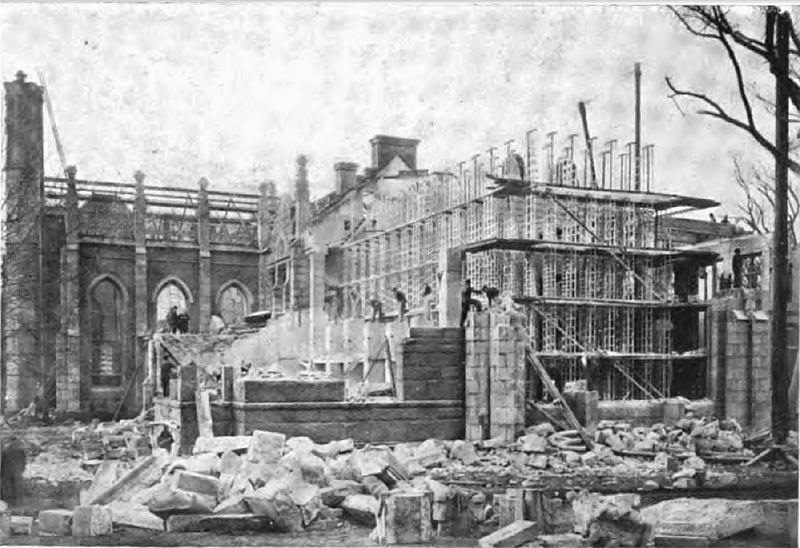 Another vestige of Gore Hall came to light when recently some repair work was being done to the Widener Library, and part of the original foundation of Gore Hall was excavated. This final atmospheric image of Gore Hall that I want to leave you with will come as no surprise to those who recall my fondness for night postcards. The beckoning lights glowing within the building would not have been a feature of the library's early days. Look again at the Warren photograph, and note the high proportion of window space in the walls; during the oil lamp and gaslight era, the administrators were so terrified of fire that no artificial lighting was allowed, and Gore Hall had to close each day at dusk. What a fascinating history you give here, so remarkably illustrated with these charming old postcards. It does seem a great shame that Gore Hall should have been razed to the ground rather than given another purpose and lease of life. Amazing the connection between it and King's College chapel, a building which is well known to us, especially for the Nine Lessons and Carols at King's to which we listen avidly every Christmas Eve. We do not think that we can recall any other night time postcards other than jose you show. They are particularly intriguing and have a most strange atmosphere about them. Why one wonders would one have a view at night of a building on a postcard? We are sure that you have an answer! We have been away for so long and you too have been absent from the Blogosphere for an age. We have missed you and are so grateful for your kind messages that keep us in touch. We do so hope that we shall see more of you in the Blogosphere in 2015 as it is a more interesting place when you are there. Hoping that you enjoyed a very Happy Christmas and that peace, joy and prosperity will be with you in the coming year and years to come. Hello Jane and Lance, Postcards, while not as early or as detailed as antique photographs, through their coloring often give a better idea of what it might have looked like when strolling by the building. When researching the King's College Chapel I read about those concerts, and was glad to see that they found a way to foster greater public involvement and appreciation of this important monument. Your comments about the night postcards are intriguing, and it is inevitable that I will have to do some serious research on the subject. The cards did appear about the same time as the Ashcan school of paintings appeared in the U.S., with their often dark and industrial subjects, and this was certainly an influence. A fad for these night views, and for postcards in general, also helped to institutionalize and perpetuate them. Thank you for all your generous praise. I am sure that it will inspire me to keep posting, and I hope that this will be a good blogging year for both the Hattatts and myself. Harvard was smart! Gothic Revival was the perfect architecture for a brand new university library in 1838. And loosely basing itself on the chapel of King's College at Cambridge was even more intelligent. The space had to function well but it also needed to tap into centuries of university history. In pre-computer days, the library was the centre of a student's life for 4 years or more. I saw the librarians more regularly than I saw my own parents! Destroying the building in 1913 was not progress. Hello Hels, Gore Hall was certainly an early example of the Collegiate Gothic in the United States, although by no means the first. Your point that the architectural style was also a symbol of the great British university is well taken. Great centers of learning are symbolized by their physical presence as well as their scholastic achievements. I know what you mean about the library taking over the students' lives. When I was in college I regularly haunted the school's libraries, mostly the huge and spectacular Sterling Library, but also the specialized music, science, art and rare book libraries. What a shame they tore the old place down in the name of progress but how wonderful to see you back were you belong. Welcome back! Hello Lindaraxa, Your kind words mean a lot to me, especially after neglecting my blogging duties for so long. You comment makes me wonder what the feelings were at the time about tearing down Gore Hall--there must have been some sentiment in its favor, and I am sure that a little research could uncover the answer. Another great US building gone and it is a shame as we have so little on historic buildings! Both of us have been to King's College for a Banquet on September 26, 1985 for a Mushroom Conference. I was impressed by King's Chapel, built in 1446 and with the longest nave in Europa of 180 m; without any pillars! Hello Mariette, You and Pieter were lucky to have visited King's College Chapel, and you bring up an interesting point in mentioning that it was started in 1446. By Gore Hall standards, it should have been removed in the year 1521, before it was technically even completed! It is indeed sad that in America (and some other places) so many significant buildings are destroyed before they have a chance to become truly antique. Also, if the builders feel that their work is only temporary, they might not build with the same quality and dedication needed to craft a monument like the King's College Chapel. And now finally I got to show you more about King's College Chapel and our Cambridge visit! Hope being able to chronicle most of our trips, for Pieter to relive them once more. Hello Jim - Seeing your first image of Gore Hall immediately brought Kings College Chapel to mind, so reading on I was not surprised to learn that it was based on the Cambridge masterpiece of late English Gothic architecture. In retrospect it is shocking that such an architectural treasure should be destroyed in the name of progress. At the beginning of the twentieth century sadly Gothic Revival was not admired or appreciated as it is today. I do remember seeing your night time postcards, they do have an other worldly quality to them especially with illuminated by the moon. There is a book, you probably know it, called Postcards of the Night: Views of American Cities by John A. Jakle. It can be bought from Amazon for as little as $3.99 and shows 80 vintage city postcards. Hello Rosemary, The Widener Library that replaced Gore Hall is a large, heavy, Neoclassical building with a long row of Corinthian columns across the front. 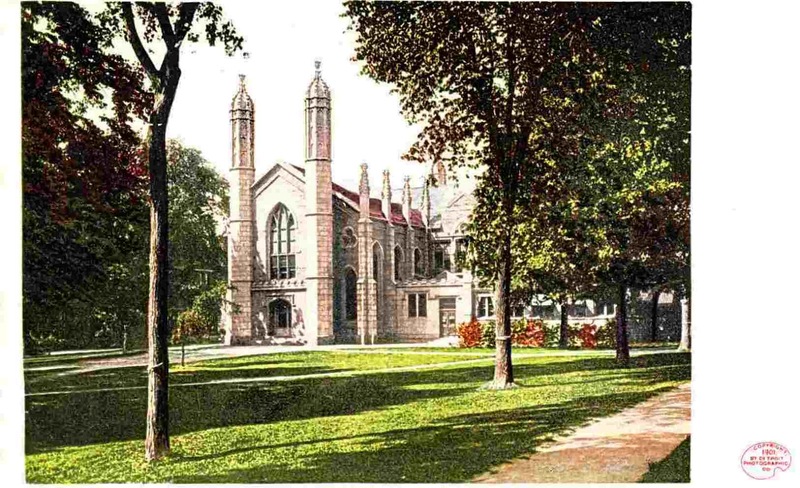 Although Gore Hall was 75 when razed, the Collegiate Gothic style imitating Oxford and Cambridge was just starting to take hold in the U.S., as for example with Boston College or Yale University. Again, Widener Library is a fine and important building; my complaint is not against the appearance of the Widener, but rather a lament that they couldn't have found a way to keep both. The night-view postcards really do have a special quality, and it is fun when various interests can be combined, such as night views of colleges, the city of Cleveland, fine houses, and so forth. Although some were made in England, it's too bad they weren't more popular there, because all of the ancient buildings, ruins and scenery would have made specular subjects for moon-lit views! It saddens me that Gore Hall was demolished, if only because it reminds me that so many other beauties have gone the same way. I spent almost a dozen years in Pittsburgh, which in the early 1800s was almost completely filled with Neoclassic structures. Today, only one remains! I agree with you that the smaller scale of Gore Hall enhanced its quality. I think that has a lot to do with how a building relates to the human scale. And I remeber your posting on nighttime postcards, which must make a tremendous visual statement when seen as a grouping. I think it's great to have a collection with such prescribed boundaries — it makes the hunt all the more exciting! Hello Mark,, You have put your finger on the issue. We all realize that some old buildings will inevitably be lost, but the fact is that there are just too many that have been torn down, even those filled with history and architectural merit. As you point out, practically whole cities have been bulldozed. If you ever get up to New Haven, make a special point to look at Yale's old Library. I am sure that you will be charmed both by the scale and the quality. About the postcards, I have been considering several ways that they could be grouped together, but haven't decided anything yet. I recall a display at the Cleveland Museum of Art that had them mounted to panels; maybe something like that. Of course, first I have to know the space they will go in! Hello Jim. I'm sad that a building of such beauty and character didn't survive a mere 100 years. Tragic that we have lost so many wonderful buildings in the name of progress. In Richmond, the White House of the Confederacy sits completely engulfed by VCU Medical Center, but at least it's still there, diminished by its surroundings as it might be. Thank you for this fascinating glimpse into our past. Hello Barbara, More and more, people are recognizing the importance of the space surrounding a building, and how that integrates with its design. Christopher Gore's house, Gore Place was narrowly saved itself from destruction. Although most of the original land is gone, enough acreage was saved, and managed through a very clever and farsighted program, to assure that Gore Place will maintain its appearance as a country estate. I have seen many old photos of the White House of the Confederacy, but had no idea that it currently was so engulfed. I suppose Gore Hall looked more elegant (than King's College Chapel), because it didn't have (or need ) the buttresses. It then lost this elegance when the addition was tacked on. But all academic (pun intended), since its demolition. It is always sad when handsome buildings meet this fate. Hello Columnist, You bring up an interesting point. When the new wing was built, one long side of the original building remained intact. However, look at the photos. All of them after the addition are taken from the same vantage point, which apparently became standard, featuring the new wing. This was likely a point of pride considering its advanced technology and implication of the importance of housing so many books. Absolutely fascinating, Jim! I think when you're younger and on campus (I didn't go to Harvard but a college beau did, ;) ) you don't give much thought to what already seems historic being relatively "new" and having a predecessor. And how interesting to see the long-lost building on the seal. At least it, and the neighboring tree, have been immortalized in print. Hopefully there are no redesigns in the near future!! That is really interesting about controlling the land; thanks for the follow-up! The ability for the land to produce income surely offsets the expenses of the original property but one would imagine that over the decades there might be high renter turn-over and pressures to allow further encroachment. I am often surprised at my own alma mater how much has already changed and developed in even just the decade since I was in school! Hello Ann, Harvard has a relatively high quotient for maintaining its old buildings, with some notable exceptions such as Gore Hall or Appleton Chapel. I do know exactly what you feel about seemingly old buildings having a forgotten history. 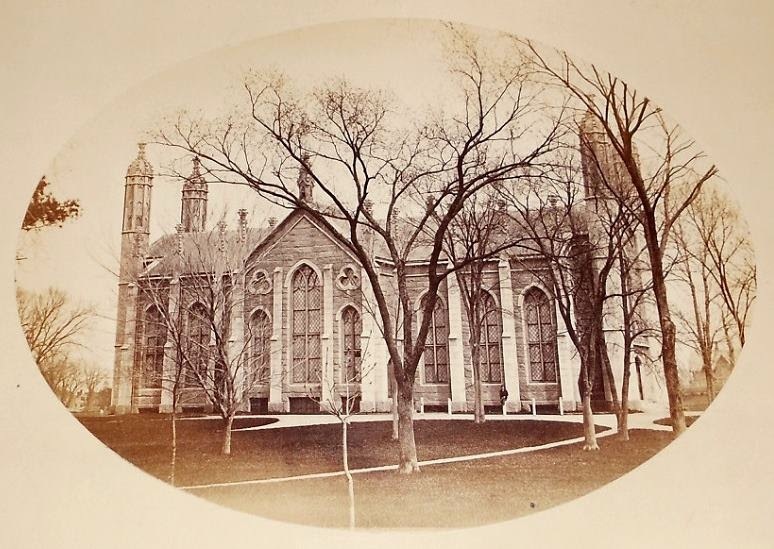 When I wrote about my old dormitory, Calhoun College, no one I talked to had any idea that the Gothic building had been the former site of the Divinity School, even though old photographs of it abound. About Gore Place mentioned in your second comment, which leases part of its acreage to maintain an income, I would imagine that since the board of the museum exists to preserve the main structure, that they would be more sensitive to what they allow on the site. I imagine one pressure today is to provide non-matching amusement areas for children, in order to attract more visitors. Universities, on the other hand, are notorious for ignoring the wishes of the alumni and the community when imposing their latest plan for development. Welcome back and thank you for this enlightening post. I've long yearned to visit Gore Place and now know a little more about the late and great Gore Hall. How terribly shocking that such a beautiful and well loved and used building should be obliterated in the name of progress! Your beautiful post cards have captured perfectly the scale of the building, when compared to the trees. The scholarly interiors must surely have eased the study of the most challenging of subjects and made it an absolute joy to write and read in amid such a beautiful setting. I recently visited the New York Public Library and felt the same about that wonderful building. Somehow, sitting in a modern and sterile environment for study never seemed right to me. Hello CD, Gore Place is one of the great monuments of Federal architecture, yet itself only narrowly escaped demolition. It certainly would be well worth visiting if you were in the area. I agree with you about having inspiring libraries to study in. In college, the awesome Sterling Library was my main destination, but books reserved by professors for courses were placed in a newer underground library, which added depressing to "modern and sterile." Of course, Gore Hall was replaced with a magnificent building, Widener Library, so that was not the problem in this case. My hometown of Cleveland is also blessed with beautiful libraries, some of which I hope to feature here in the future. I'm happy to see you blogging again! Yes, Jen, I do love these old buildings, and through old photos we can visit them as they appeared in the past, sometimes in pristine newness, and sometimes in a state of desolation. The library administrators were not being arbitrary with their early closing rule. In the 18th century, a fire had completely destroyed Harvard's library, including almost all of the books originally donated by John Harvard. Welcome back! I've been so busy getting the house ready to sell.....almost missed this post, and what a shame that would be to not enjoy your feature on Gore Hall. And what a shame this architectural treasure is no longer standing - very sad indeed. Glad to know it will live on as a part of the seal of the City of Cambridge. Gore Hall reminds me of a handsome cathedral. How marvelous it must have been to study inside the nave-like hall. I will be in Boston for a wedding this fall, and hope to visit Cambridge. Hello Loi, I still hate to think of your selling that house in D.C., which you have brought to such perfection, although it is exciting to see the development of the new house in Maine. I do hope that you make it to Cambridge. Gore Hall might be gone, but its successor, the Widener Library, is well worth a visit, especially the beautiful Harry Elkins Widener Memorial Room, containing the collection of the Widener who died on the Titanic. Especially recommended is the Houghton Library, which houses Harvard's main collection of rare books, and which usually has special displays on exhibit. Thanks for the suggestions, Jim. I'm looking forward to the visit - hope the fall colors will be near peak. Really? Those buildings look amazing and prestigious in itself. What a historical place Harvard is.